Congress Works to Cripple Chinese Companies Spying on U.S.
New bill would penalize Chinese telecoms conducting espionage in U.S.
A bipartisan team of lawmakers is currently pushing new legislation that targets top Chinese telecom companies such as ZTE and Huawei, both accused of running spy operations on U.S. soil in order to gather intelligence on behalf of the Chinese Communist government, officials told the Washington Free Beacon. 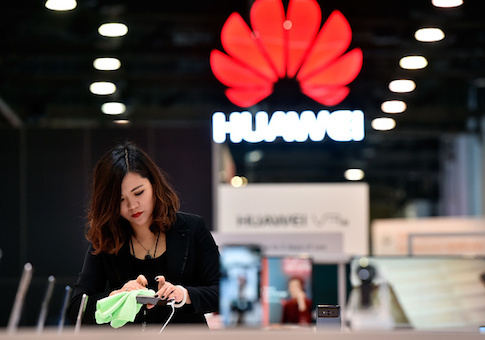 The effort follows revelations that Huawei allegedly violated U.S. sanctions laws by moving millions of dollars to Iran as part of a scheme to skirt American statutes barring trade with Tehran. The company's chief financial officer, Meng Wanzhou, was detained earlier this year by Canadian authorities after the company was tied to Chinese military intelligence services. Similarly, ZTE was banned by the U.S. Commerce Department last year for lying about sanctions violations. Lawmakers and congressional officials familiar with the effort to ban these companies in the United States told the Free Beacon they are essentially a spy arm for the Chinese Communist government and should not enjoy free-trade privileges in America as a result of their efforts to undermine U.S. sanctions and steal American intellectual property. Congress balked last year when presented with an opportunity to sanction these companies and effectively shut them down, but congressional insiders say this will not happen again, as a bipartisan team of senators works to ban all U.S. exports of key technologies to both ZTE and Huawei, according to new legislation. In pursuit of this end, Sens. Tom Cotton (R., Ark.) and Chris Van Hollen (D., Md.) joined with Reps. Mike Gallagher (R., Wis.) and Ruben Gallego (D., Ariz.) this week to introduce new legislation that would force President Donald Trump to issue denial orders barring the export of U.S. parts and components to any Chinese telecommunications company known to be in violation of American sanctions. The end goal, lawmakers told the Free Beacon, is to bankrupt these companies in order to stop them from stealing American trade secrets and clandestinely spying on U.S. firms for the Chinese Communist government. "We shouldn't make it any easier for Huawei or ZTE to do business in the United States or around the world," Cotton told the Free Beacon. "If they violate our sanctions or export control laws, we should put them out of business." "Chinese telecommunications firms like Huawei represent a growing threat to American national security," noted Gallagher in a statement. "As state-directed enterprises, they ultimately report to the Chinese Communist Party and will be employed where and whenever possible to undermine American interests and those of our allies." This new bipartisan legislation "sets a simple standard: if a Chinese telecommunications firm is found to have violated U.S. sanctions moving forward, it will be subject to the same severe punishment originally imposed on ZTE," Gallagher said. The new legislation would shift U.S. policy to enforce denial orders banning key exports to these companies, directing the president to impose what lawmakers described as "strict penalties" on any telecommunications firm found to be in violation of American sanctions and export control laws. The bill would ensure these penalties remain in place until the foreign companies demonstrate they are in compliance with American law. This could take the companies years and impact their bottom lines. Additionally, the legislation would give Congress far more leverage in imposing penalties and forcing the White House to adhere to strict regulations, despite how they might interfere with diplomacy. One senior congressional official working on the matter said lawmakers would not again miss an opportunity to harshly penalize foreign telecom companies known to be conducting espionage operations. Efforts last year to impose similar sanctions fell through, but Congress will not allow this to happen again. Last year's effort to penalize foreign companies such as ZTE and Huawei was cast to the side after ZTE spent scores of money lobbying U.S. official against the measure. "This is Congress asserting, as we did back in July 2018, that we need to put these Chinese telecoms companies that are acting effectively as arms of the Chinese Communist Party, out of business," said one senior congressional official. "We let the opportunity slip through our fingers once. We're not going to let that happen again." This entry was posted in National Security and tagged China, Congress, Huawei. Bookmark the permalink.